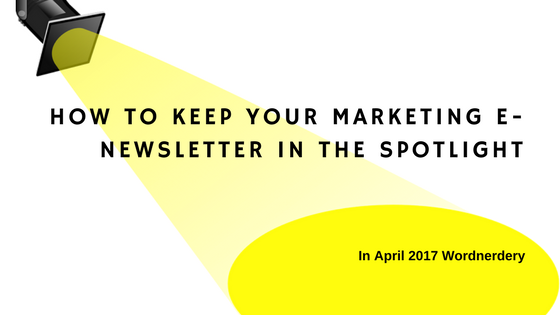 Email newsletters are back – or maybe I should say are still – in the spotlight. And whether sent by large companies, media giants or solo entrepreneurs, email newsletters can be a powerful marketing tool. For example, the content marketers at Copyblogger get massive amounts of traffic every day. But the biggest day every week is Thursday, when they publish a weekly email digest that goes to more than 222,000 people. “Email is far and above the most valuable audience channel,” says founder Brian Clark. #3. Be useful. What’s in it for the reader? Provide helpful advice, tips, current thinking, industry news roundups or insider views. Some e-newsletters that do this well are Michael Katz’s Likeable Expert Gazette; Ann Wylie’s Wylie’s Writing Tips; Daphne Gray-Grant’s Power Writing; and Anne Miller’s Metaphor Minute. #6. Help your newsletter stand out in a crowded in-box. Include descriptive words in the subject line that let the reader know what’s inside, says Nielsen Norman Group. No, “April 2017 newsletter” does not do the trick. Find more examples of newsletters in the spotlight and tips for getting there in Wordnerdery. It’s a quick monthly read about words, effective/expressive writing, newsletters and more, including the occasional ponderings on the meaning of life. Not a subscriber yet? You can sign up right now. In keeping with Canada’s anti-spam laws, you can easily unsubscribe any time.